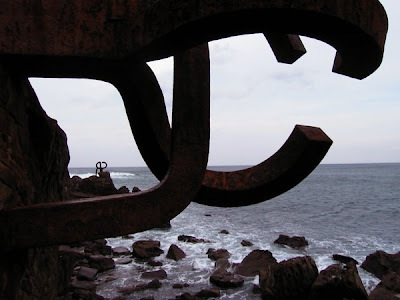 Eduardo Chillida, Wind Combs, 1972-77. Photo: Justin Knecht. About 1982, I began to see a relationship between the process I used making monotypes, and the process of zen brush work which I described in “The Essence of Sho.” I found that on a given day, with the same ink, palette, brush and paper I could wind up with vastly differing results. The same black ink would be muddy and lifeless in one example, and crisp, alive, magical and vibrant in another. Not only did it look as though I was using different paper or better materials, but the works also succeeded in moving beyond my expectations in terms of content. Mind you, this would happen one out of a hundred attempts – but it was worth the wait. Zen painters speak about the intention and the moment in which all the variables are united in a state of no mind; with pure intention, magic can happen. It is not making things that is difficult; what is difficult is putting ourselves in condition to make them. I believe works conceived a priori are born dead … I cannot begin a work until I have, how shall I say it … (he sniffs the air, like a hunting dog) … got the aroma. The scent of the piece. That is what I follow. Not an idea or form. I’ll be blogging about both these artists again, but let me make this third jump and propose that haptic is to wave as visual is to particle, or haptic is to Quantum as visual is to Newtonian. Yes, I do believe that from the beginning of time (and increasingly as our awareness of the practices, cultures and artifacts on our planet progress) there have been artists, philosophers, healers and etc. who have manifested their gifts in processes which look strikingly like modern definitions of quantum sciences (read anything by David Bohm, who has written much about the creative process and Stuart Hameroff M.D. who has written a lot about why this Quantum stuff looks like Zen). This post is not a complete answer, but I’m going to keep trying. For 28 years I have been collecting references, artifacts, quotes, books, experiences and art linked to resonance, frequency, intention, light, sound and more. Are human beings of the 20th and 21st centuries the first to call themselves quantum practitioners, or just the most recent? This entry was posted on Wednesday, January 30th, 2019 at 19:25	and is filed under For Peace. You can follow any responses to this entry through the RSS 2.0 feed.